Today I'm so pleased to be able to welcome Paul Collins to The Book Chook. Paul is the brains behind Ford Street Publishing, an Australian publishing company that has won my heart because of the high standards it sets. 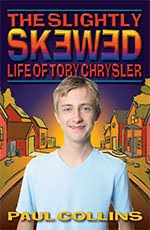 Paul is also a writer - his latest novel, The Slightly Skewed Life of Toby Chrysler, has just been published by Celapene Press. BC: What sort of books do you think young people want to read? Can you give some examples and say what it was about those books made you choose them from all your submissions? PC: I have a pretty eclectic taste so I’m not confined to boundaries like major publishers or publishers of ‘literature’. As a one-person show, I don’t have to answer to anyone, either. I grew up without a book in the house. My staple diet was comics. I collected seven Marvel Group comics such as Captain America, Iron Man and Daredevil. Despite this background, I like to think I know a good book when I read it. If it’s genre fiction, it needs to be fast-paced and hold my interest. Being well-written is a given. If it’s contemporary, it needs to be issues-based or edgy, and have a literary feel to it. For examples of what I mean take a look at My Private Pectus by Shane Thamm, They Told Me I Had To Write This by Kim Miller, or f2m by Hazel Edwards and Ryan Kennedy. They all share the same attributes that I’m discussing. BC: Have any of Ford Street’s books won awards? PC: They’ve been short-listed in the NSW and Victorian Premiers’ awards, the NT Literary Awards and the Chronos Awards. BC: You’re a writer as well as a publisher. Do you give writing workshops to kids? If so, how do you motivate them to write as well as read? PC: If you can interest them in writing, you’ll hook them on reading. That certainly worked for me. I was, as I explained, a reluctant reader. To some extent, I still am. But to write, you have to read. With workshops I show them shortcuts on how to write. I give them an interesting line like ‘Lightning flashed. In that brief, stark light, I saw someone standing at the window. But when I peered outside the grounds were empty’. I invite kids to write their own mysterious beginning, or use mine. And then they have to continue the story. You’d be amazed the interesting stories that come out of this. A more obvious ploy is to give them an interesting book cover and say, ‘Pretend this is the cover to your story. Write a few pages around this cover’. When asked what I read, I tell them action novels like The Mortal Engines and Artemis Fowl books. BC: This begs the question: are they the type of books you write? PC: The bigger novels, certainly. Each book in The Jelindel Chronicles is 100,000+ words long, and despite having a female heroine, there are two strong male characters who provide plenty of action around Jelindel. I wrote a post-holocaust trilogy called The Earthborn Wars, and they’re adrenalin-packed. The other series that I co-edit with Michael Pryor is The Quentaris Chronicles. They’re written by different authors because it’s a shared-world, so they’re not all action-packed, but the seven I’ve written are. This series has its own website. BC: The Slightly Skewed Life of Toby Chrysler is contemporary and you’ve still managed to pack a lot of action into that. PC: The trick with a short book is to have a plot that can easily go a longer distance, yet keep it at a certain wordage. A mistake some writers make is that they write 60,000 words for a book with a target audience of 8-10 year-olds. Now some kids in this age group have read Lord of the Rings, but they’re superlatives. So Toby is pitched at this age group with a plot to grip their attention with very few slack moments. I could’ve easily written another 10,000 words for that book, but it would’ve failed to keep the kids’ interest. If you go to http://goldcreek.act.edu.au/yara/ you’ll see a Year Six kid’s comment that he just likes the whole book. And this is the sort of thing I aim at with shorter books. BC: You have a great learning tool in this book, too. Tell us about the malapropisms. PC: A writer’s trick is to give characters a specific trait. The character might flick their hair back; chew their lower lip when thinking (or their tongue might protrude); they might have a twitch in the right eye. I wanted Fluke to utter malapropisms. So a decaffeinated coffee becomes a decapitated coffee; for all intent and purposes becomes for all intensive purposes; charity begins at home becomes clarity begins at home. The trick is to make sure the verbal gaffes all relate to the actual story. At the back of the book I list the proverbs correctly. Teachers can then ask the students what they think these proverbs mean. As an aside, some of my favourite malapropisms are: ‘The town flooded and had to be evaporated’, ‘dysentery in ranks’ and their friends were ‘very effluent’. Students could search the internet for more. It’s fun. BC: I have heard on the grapevine that you are a great publisher to work with. I suspect that is partly because you ARE a writer, and so you can see those both sides. PC: I’m quite possibly a Jack of all trades and master at none. But I do have an understanding of both sides and this makes it easy to liaise with authors. I certainly give my authors and illustrators more publicity than the major publishers would. I devote a lot more time on my books than say a major publisher could afford for a publicist on its books. My time is free, but if I were charging an hourly rate, no single book’s budget could pay for me. BC: I would like to ask you what you would say to a mum who is tearing her hair out because her 13-year-old son doesn't want to read. Any advice? PC: Not that I publish them, but I’d suggest trying graphic novels. As I mentioned, comics really hooked me. And I suspect if I’d known about graphic novels I would’ve advanced on to them. Also, you can’t beat chapter book series like Just D’Ath’s Extreme Adventure series. I’m also publishing a similar series later in 2010 called Hazard River. A literacy consultant told me the series reads better than most of its ilk. These aren’t literary giants, but they’ll get kids reading. Other series are the Zac Power books and even the Aussie Chomps. BC: How about writing? When did you start? PC: I have no idea what made me think I could write, especially without being a book reader. However, I do remember as a twelve-year-old looking at the houses in my neighbourhood and feeling depressed, knowing that nothing in my life was going to change. I’d merely shift into another nondescript house, get a job in a factory, have a family, retire and die (as an aside, I’ve avoided every item on that Dread List). Rather a morbid thought for a kid. I knew I wasn’t A-level at sport – I was usually on the reserve team in anything I tried like soccer, cricket or rugby. I later tried kick-boxing, but was an average fighter. I needed something that would set me aside from the norm. Writing seemed to be the ideal answer. I mean, how hard could it be? Sadly, I found out! So I took a detour and became a publisher. I actually published Australia’s first heroic/epic adult fantasy novels in the early eighties, way before the local major publishers decided there was money in them thar hills. But I didn’t have good distribution, and when a second distributor went bust and took all my stock and money, I decided to try writing again. Luckily, HarperCollins picked up on a fantasy novel called The Wizard’s Torment, and since then I’ve had about 130 books published. Now I’ve come the full circle and returned to publishing, but I still have a need to write, hence I have a few books coming out every now and then. BC: Thanks, Paul. It's been fascinating to gain insights into how Ford Street works. As for your writing, I am in awe of anyone who's had 130 books published!